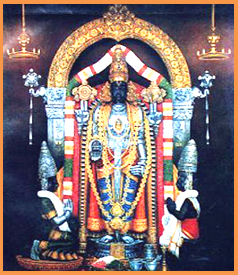 The appearance is similar to that of the Lord of Tirupathy and is considered as His elder brother. Those Unable to go to Tirupathi can do their prarthana here and it is taken as equivalent to prayers offered at Thirupathi. Whenever Oppiliappa perumal's idol is taken in Procession. He is always accompanied by Bhoomidevi. Perumal wont step out the temple without Thaayar in order to keep his promise. Markandeya maharishi is seen on the left side of the Lord. As per wishes of the wife of Markandeya the prasad is offered without salt, hence the place is also called Uppilliappan (Lord without salt). It is believed that those who take salt or salted food inside the temple will go to hell. Monthly Sravana nakshatram and the Aypasi Brahmotsavam are very important days. Mangalasasanam Thirumangaiazhwar, Poigaiazhwar, Peyazhwar, Nammazhwar. Access to the temple One can reach the temple from Thirunageshwaram, next to Kumbakonam. Direct buses to the temple from Kumbakonam available. Pratyaksham Markendeyar, Garudan, Cauvery, Dharma Devas. All Prasadas in this Kshetra is offered without salt. The Moolavar of this Kshetram is Oppiliyappan. He is also called with the name "Uppiliappan". The Moolavar is found in Standing posture facing East direction. Prathyaksham for Markandeya Maharishi, Lord Garuda, River Kaveri, lord of Dharma. It is located at around 5 kms from Kumbakonam on Kumbakonam - Karaikal Road. The Temple is 1/2 km from the main road. The Town buses from Kumbakonam will stop near the temple. Near this temple you have other famous temples like Thirunageswaram, Ayyavadi. Boarding & Lodging are available near the temple.